It’s that time of year. From my front porch I can smell red ferments ebbing from the winery on northerly breezes. And we’re spend most of our time tending our tanks. Pump overs. Punch downs (they call it “plunging” here but I refuse to cooperate; “punch down” sounds way more accurate and way more awesome). Additions. Inoculations. Sampling. Taking temperatures. Dry icing. That’s about all we can do until the fruit starts pouring in through the rafters again. Which it soon will. Cab and Syrah make up nearly half our production and samples are still circling 20 Brix with high acid levels so we’ll keep them on the vine while the weather holds. In the mean time, we’re experiencing an anticipated breathing period – a glaring contrast to the weeks previous, during which we could barely stand up. We have three primary staging areas for pump overs. The goal is to juggle all three, in addition to the punch downs and anything else going on. All the pump overs run for different lengths and with pumps of varying speeds and set ups of varying ease. But there’s a rhythm to it. 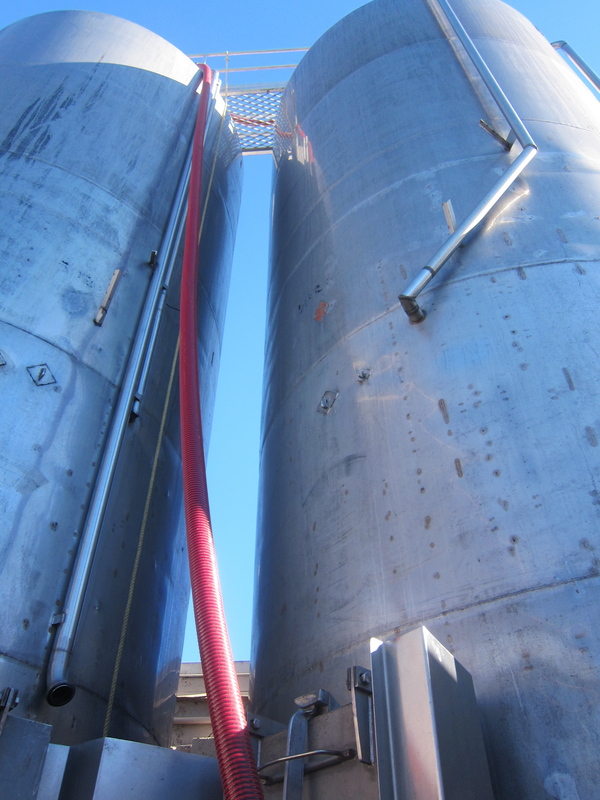 We’re substituting pump overs with a pulse-air system on some tanks. Pulse-air is basically awesome. You stab the ferment with a 10-foot steel spear hooked up to gas – compressed air on sophisticated systems; nitrogen or dry air (not dry ice, which is just CO2; dry air replicates the components of ambient air) on our homemade version. The spear breaks apart the ferment’s cap with bursts of gas and the juice from below gushes over the surface like a volcanic eruption. I love it. It’s quick, painless, makes no mess, and works like I dream. I want my own. I want to give them as gifts to everyone I know. With pump overs and punch downs, the keys are rhythm and leverage, pacing and bracing. Figuring out which tasks can be done simultaneously and which require singular attention; which corners can be cut and which can’t. Unwieldy, fussy pumps and hoses and steel arms and juice tubs and power cords and cumbersome screens that need hauling around in various ways for various purposes – each of these and more require their own sensitive touch. Lifting or shoving or pulling things can only get you so far, though god knows I try. Knowing what you can rest or roll or balance or sidle or lever or prop or buttress and how and where makes all things faster, easier, less sweaty. Because it’s hot up there on top of ferments, just like I remember. 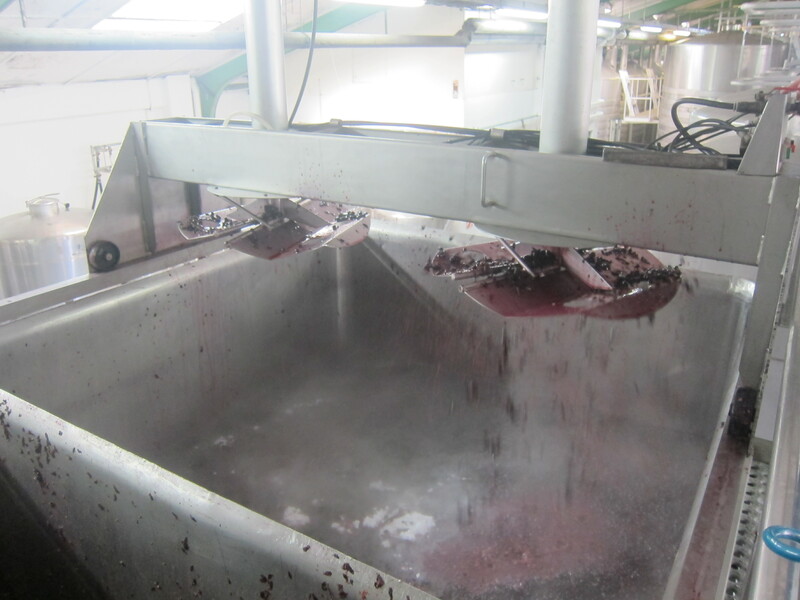 Up on top of our open-top tanks, holding between 3 and 5ish tons of red fruit, it is steamy. The yeast is roaring, the sugar is plummeting – these things are basically breathing fire. One of them ate – literally swallowed – the sampling tool. I had to fish it out with a whisk and half of my body, turning my head away to stay conscious. After a punch down, the air floating above the cap is hazy with heat and CO2 released by the plunging. 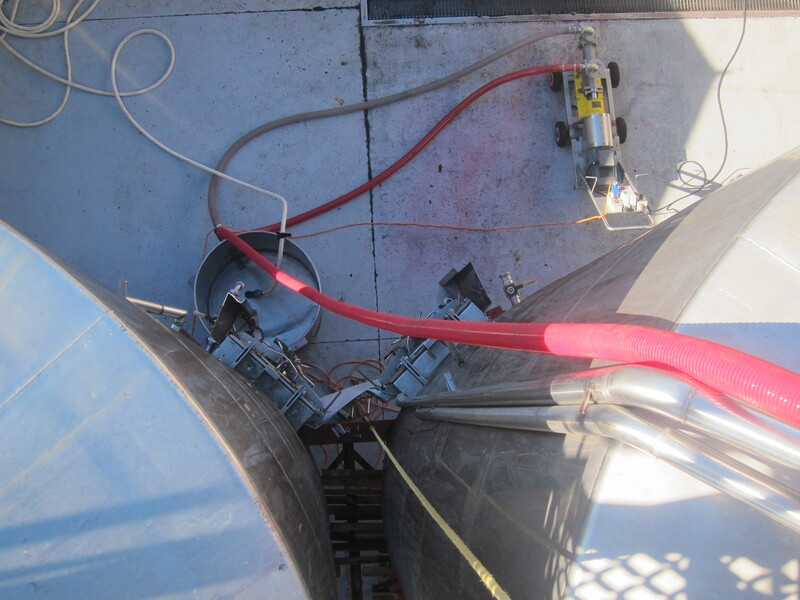 We have a built-in pneumatic punch-down mechanism on a few of our open-top tanks. There are many different designs for such beasts. 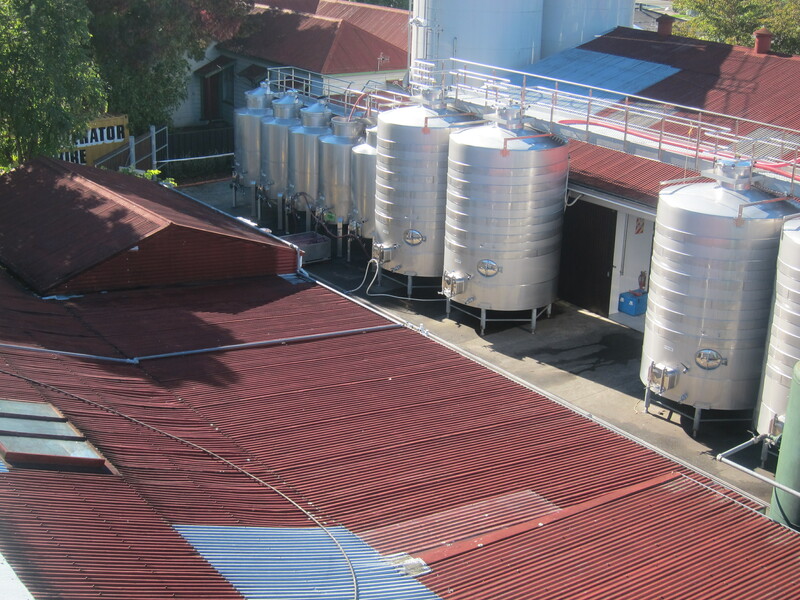 Ours sits on runners above the tanks and can be rolled from ferment to ferment. It has two steel plungers controlled by an air pressure valve. 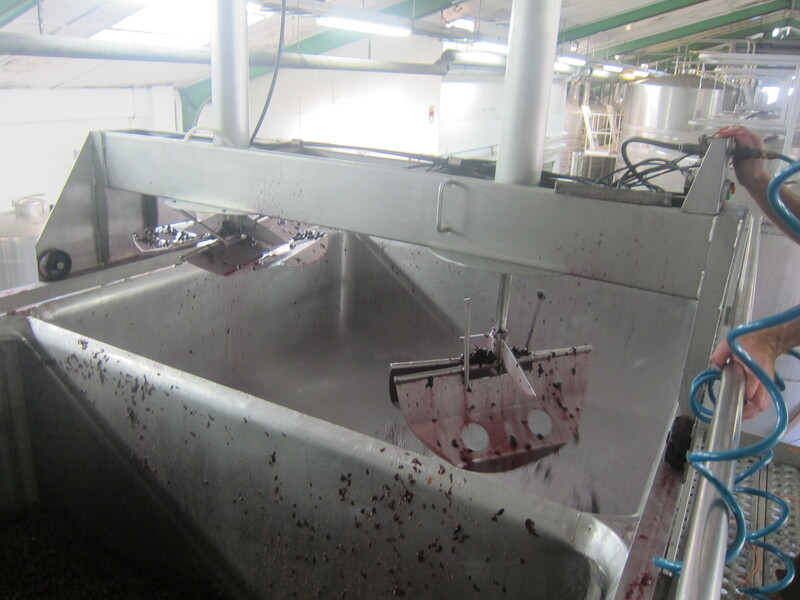 They take the heavy-lifting out of it; manually punching down the cap on a sizeable ferment, especially in those early stages when it’s like a granite slab, is damn tough, as I well know from Donelan. But frankly, the pneumatic seems hardly worth the trouble. It makes a huge mess, sending fruit flying all over the insides of the tanks, the catwalks, the walls, the floors, the neighboring tanks, and me. After each use, the whole thing and everything inside a twenty foot radius has to be hosed down. We have to hang off a two-inch wide ledge, ten feet in the air, just to sponge off the back lip of the tanks in largely fruitless attempt to discourage fruit flies, which have reached biblical proportions. As I hung off the back edge of the tank giving it a sponge bath, I thought about how half the work in a cellar and in vintage could be classified has high-risk cleaning. Half of the time, you’re working directly with wine, fruit, or juice. The other half is spent on the kind of cleaning where you need to wear a harness and a head lamp and sign a consent form. And then there’s the fixing. Equipment is never sufficient or completely reliable or foolproof. The must pump on the destemmer blows during a torrential downpour. The remote for your pump gives out when you need it most, failing to stop the pump when you press “stop” or electrocuting you on top of a silo (true story). The bag punctures in the transport pallecon you’ve just filled and you have to transfer 1000 litres of wine while a truck driver waits. A certain amount of forethought and anticipation can minimize these routine and untimely hiccups, but they’re also inevitable – another form of Tetris. The cellar demands an elusive combination of damage control, engineering, MacGyver reflexes, and a wrench. Seriously. There’s almost nothing that a wrench (spanners, they inexplicably call them here) can’t at least help. 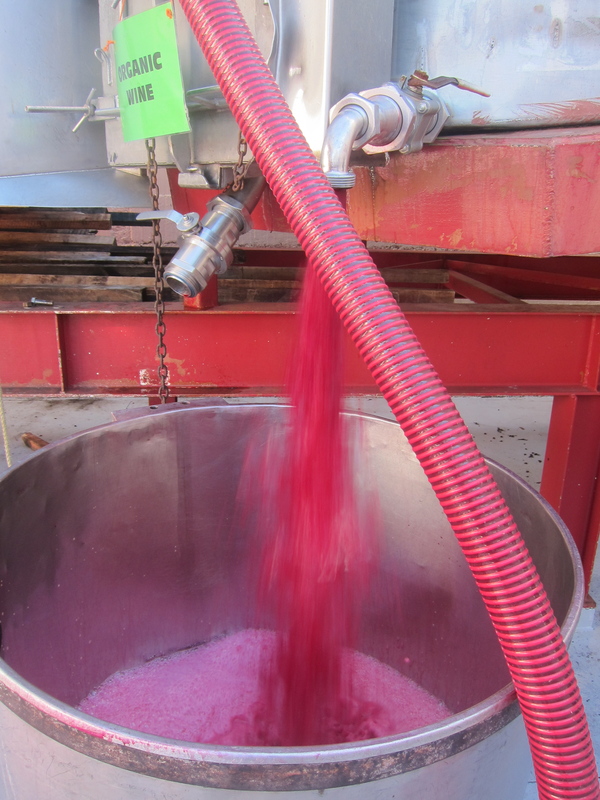 We’re starting to press out our first red ferments and digging season is about to kick us in the face – more on that next. Soon enough the rest of the reds will land and we’ll set our hair on fire again.